As you know, you can achieve Microservice architecture by using Service Fabric, but you might want to need request routing features for your applications for multi languages, cross devices or others. In such a case, you can use API Management for it. In this article, you can learn how to setup API Management with Service Fabric. At first, make a REST API application and deploy it into your Service Fabric cluster. Note to edit "ServiceManifest.xml" file in your Service Fabric project not to specify actual port like below. This setup is needed to collaborate API Management and Service Fabric. 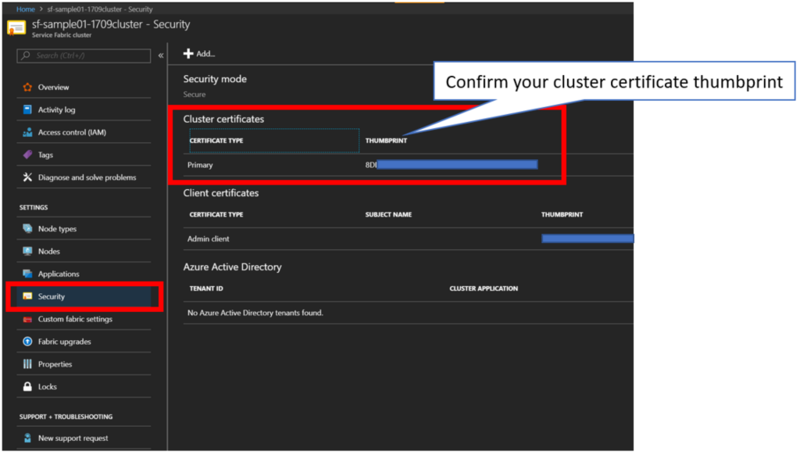 You probably created the certificate automatically when you made your Service Fabric cluster. Go to your Service Fabric cluster, choose "security" tab and pick up the certificate thumbprint like below. Next, download the certificate file as pfx into your machine. Go to KeyVault, choose "certificate" tab, select your certificate and choose "Download in PFX/PEM format" like below. Save thumbprint and pfx file to use ARM Template in later section. Download apim.json and apim.parameters.json ARM Templates from service-fabric-api-management/apim.json at master · Azure-Samples/service-fabric-api-management · GitHub. And add '"validateCertificateChain": false into apim.json' if you will use self-signed certificate file like below . "value": "base64 encoded string of your pfx file. don't insert breaklines"
"value": "your Cluster certificates thumbprint"
"value": "<policies>\r\n  <inbound>\r\n    <base />\r\n    <set-backend-service backend-id=\"servicefabric\" sf-service-instance-name=\"fabric:/SFApiApp/Web1\" sf-resolve-condition=\"@((int)context.Response.StatusCode != 200)\" />\r\n  </inbound>\r\n  <backend>\r\n    <base />\r\n  </backend>\r\n  <outbound>\r\n    <base />\r\n  </outbound>\r\n  <on-error>\r\n    <base />\r\n  </on-error>\r\n</policies>"
You can put blank for certificatePassword value if you created your certificate file automatically. Refer to commands for base64encode for your certificate below if you need. It should takes 30 or 40 minutes to complete this deployment. Go to "Developer Portal" of your API Management, choose "Service Fabric App" among APIs and click "Try it" button. 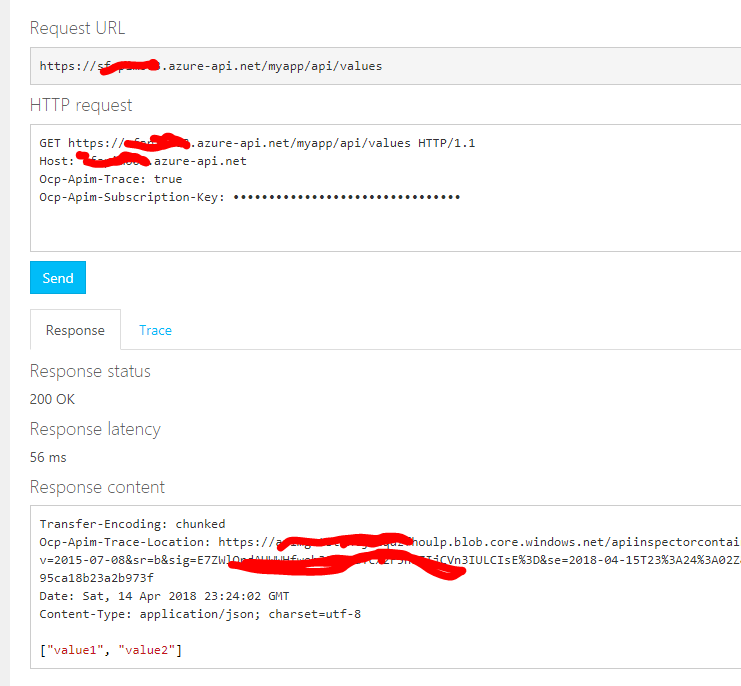 Now, you can send requests to your API application via API Management like below. Tips No.1: Troubleshoot - "Service Fabric exception when trying to resolve partition: A Security error has occurred, failed to verify remote certificate"
You might get error messages below if you use self-signed certificate file. You should forget to update apim.json. Refer to " Deploy new API Management instance by using ARM Template" section in this article. As you know, Service Fabric uses multiple certificates for itself. 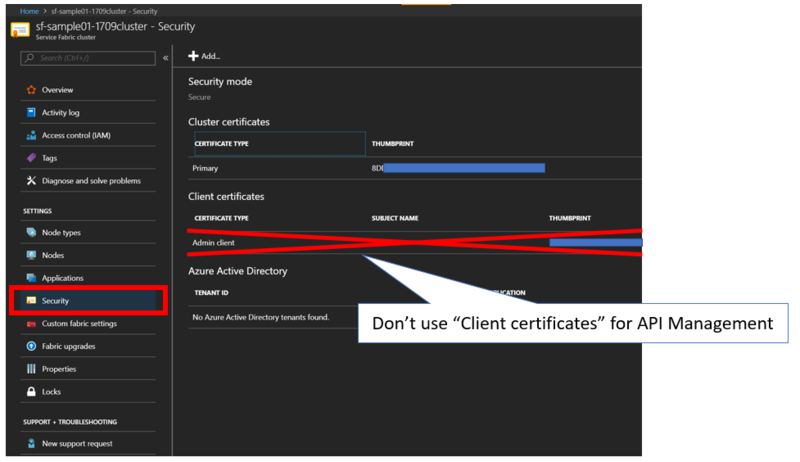 Note that use "Cluster certificates" not "Client certificates" for API Management. GitHub - Azure-Samples/service-fabric-api-management: Azure Resource Manager templates to create a Service Fabric cluster with Azure API Management.